I’m one of the Best! So says the Alberta caucus of the Playwrights Guild of Canada, anyway. The weekend of May 29 to 31, 2015, the annual PGC Conference will be held here in Edmonton. 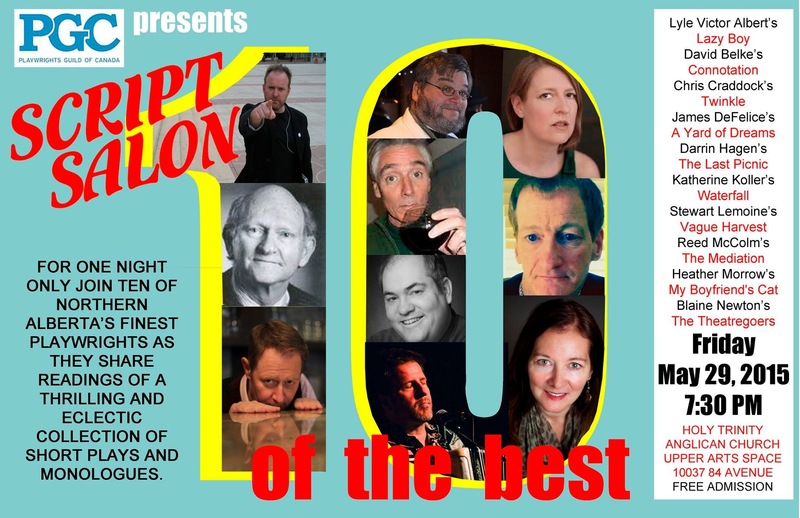 And on the very first night, ten short plays by Edmonton writers will have public readings at the latest Script Salon. A brand new snippet of mine, My Boyfriend’s Cat, will be one of them. It’s only occurred to me now that this is a national event, and other theatre folk from all over Canada will be here and may be hearing my work. So. Cool. This entry was posted in performance, photo, publicity, storytelling, theatre, writing and tagged alberta, audience, drama, edmonton, one-act, pgc, playwrights guild of Canada, reading, scene, script salon, theatre, writing by theatrejunkiehm2012. Bookmark the permalink.